BREAKING NEWS: Full social integration from back-end to front-end users. 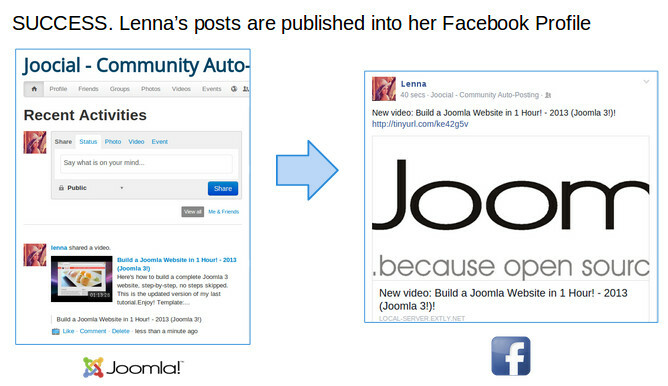 Until now, Joomla! social auto-posting has been focused on backend configuration to site-wide social channels. Today, in Joocial v7.2 Beta 1, we are releasing Front-End User Social Channels, to enable user-level social auto-posting. Registered Users can enable their social channels E.g. Facebook. All User Activities in site are published to User Social Channel. A site-wide channel works for general auto-posting, publishing as usual to site channels. A user channel publishes only to User Profile. In the upcoming weeks, we are relasing the final version, including Front-End Auto-posting for Twitter and LinkedIn. As always, we appreciate any feedback you have on the Beta 1, it helps us to improve the product and service.